Mia Dennett is the twenty-something daughter of a prominent Chicago judge, a woman who was rebellious in her teens and unconventional in her adulthood – to the disappointment of her parents – but is now settled as an art teacher in an inner-city school. When she meets Colin Thatcher at a bar one night, she likes him enough to decide that a one-night stand is a good idea. Unfortunately for Mia, Colin was hired to kidnap her and deliver her to someone who he assumes will attempt to get ransom from her father. When Colin decides he can’t hand her over to his unknown employer to be hurt, raped, or worse, killed, he takes her to a remote cabin in Minnesota. Mia’s mother, Eve, and the detective on the case, Gabe Hoffman, work around the clock in hopes of finding them, but Colin is sure that he has a plan to keep them both safe – if they can survive Minnesota’s cold winter long enough to act on his plan. What a roller coaster of a book! What’s unique about The Good Girl, to me, is that for a thriller it was not at all what I’ve come to expect from that genre. While the kidnapping itself was thrill-rideish and the drive to the woods made me have heart palpitations because I didn’t know what the heck this guy was going to do with her, once they got to the cabin the book settled down a LOT. As in, they were basically stuck in this cabin, just the two of them, for days and weeks on end and it almost got a little boring. But it never did because I continued to be on the edge of my seat, just waiting for something to happen. And I wasn’t disappointed in that something, when it did eventually come. But no spoilers. I loved how the book was told from multiple points of view, but never Mia’s. Some readers might have found this annoying, but to me it worked really well. It was almost as though Mia was the center of the story, but she wasn’t the point of the story at all. Instead, Eve, Gabe, and Colin got to tell their stories and it was all about how Mia defined their lives during this period of time. The writing in this book was excellent. It was the perfect mix of being evocative and just giving me enough so that I couldn’t stop turning the pages. Kubica really knows how to write a feeling and sense of place, and she did such an incredible job with this one. I felt like I was in that cabin with them, subsisting on canned chicken noodle soup and being so close to freezing to death. The ending wasn’t exactly shocking – the whole book is rushing toward something, and you know it can’t possibly be good but you can’t stop reading anyway – but I was somewhat surprised by what Kubica chose to do with these characters and their story. 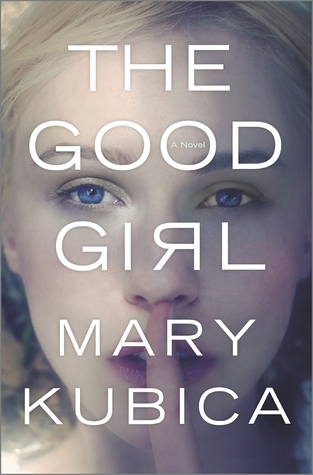 Overall, The Good Girl is an excellent book and one that I won’t soon forget. I’m very much looking forward to what Kubica does next. I was looking at the cover too. Did not notice the nose-picking angle – ha – but the ‘r’ is turned around. Wondered about that. I’ve had this one on my TBR pile for a bit. Think I will move it up. Thanks for sharing! I;ve been meaning to try this one, but still haven’;t — thanks for sharing. It seems like everyone is reading this lately! I can’t wait to get my hands on it! I just finished the audio of this yesterday! I loved it! You’re right, the multiple perspectives really let you see the story from all sides. I loved this on audio. I don’t think I gave it five stars, but I can’t remember why now. All I know is that it wasn’t what I expected at all, and I love that. I enjoyed your review Heather. I just finished this book and will post my review next week. I liked this book a lot!